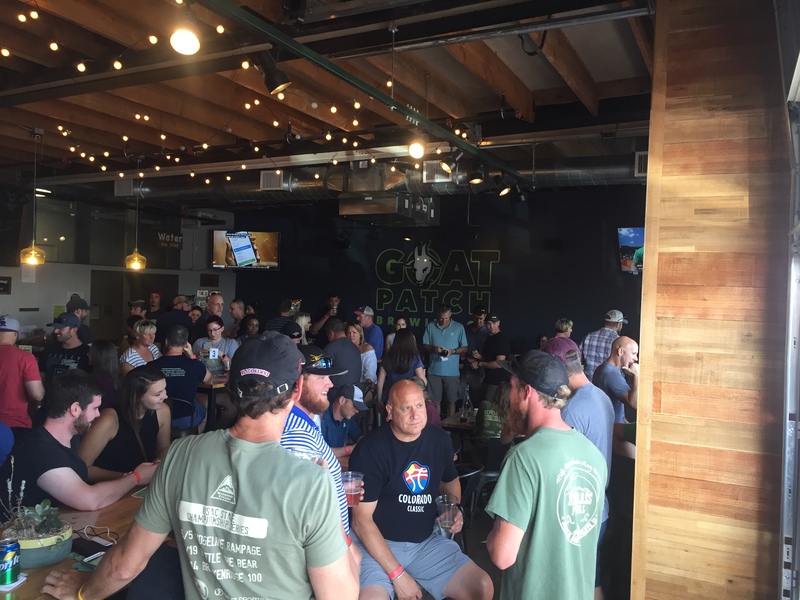 Goat Patch Brewing Company in Colorado Springs has seen great successes in their first year of business – they just celebrated their one year anniversary on July 28th. I recently sat down with Darren Blaze, head brewer and Co-Owner of Goat Patch Brewing, to talk about how the past year has been for them, and what they anticipate for the future. After only one year the brewery is already ahead of their anticipated schedule, but luckily they built with room to expand. 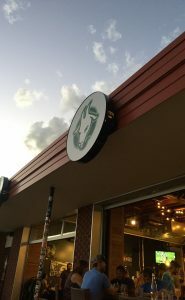 Goat Patch is located in what has been deemed The Lincoln Center, an elementary school turned community center in Colorado Springs, and Goat Patch snagged the old auditorium to hold their brew house. They are currently brewing double batches on a 15-barrel system. Starting with 3 fermenters and 1 bright tank they’ve already added an additional three fermenters and an additional bright tank. Darren said that eventually they want to add a small canning line. I asked him if canning meant they had distribution in their sights, he said no, stating that for now they have no solid plans for distribution, as right now there is a lot of competition, especially with the new law that allows beer sales in grocery stores. For the time being he says he’s “happy just selling kegs to local accounts” and cans will be available for on premise sales. Darren holds a solid brewing background in the Colorado Springs community. With a start on the bottling line at Bristol Brewing Company, he eventually moved to the brewing side and lead the charge on Bristol’s Skull and Bones series, a series that brought barrel-aged beers into the early craft beer scene in Colorado Springs. From there, Darren spent three years as head brewer for Trinity Brewing, and four years as the head brewer for Colorado Mountain Brewery at the Roundhouse. Darren tells me it was always in the back of his mind to open his own place and the opportunity came one day when a group of friends and him were talking. 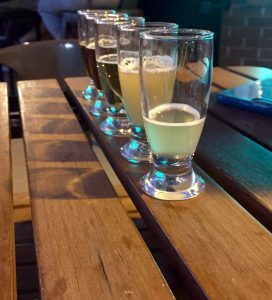 This group of friends were looking to invest in something, and liking Darren’s beers, they dived right into opening Goat Patch Brewing. With his background in the Skull and Bones Series Darren says he is constantly asked if he’ll start up a barrel aging program at Goat Patch. His answer is yes, but it’s a bit further down the road, once some of the space they have becomes more available. The current lineup of beers have received enthusiastic responses, and there have already been some surprises along the way. While testing the brewing equipment, Darren brewed up a hazy IPA, a beer he’d not done before, and only intended to brew once. When it ran out in the tap room he tells me “the demand to bring it back was overwhelming.” Now Hazy IPA is their top selling beer. Goat Patch is also very much involved in giving back to the community they’ve known and loved for so long. For every pint of their It Takes a Tribe Red Ale sold, the purchaser is given a token which they then use to contribute a dollar from their purchase to one of two non-profit charities. For the first year the charities were UpaDowna and organization that provides access to outdoor adventures for everyone, and Home Front Cares which grants emergency financial aide to Colorado military families . This year’s charities are Realm of Caring, an organization offering cannabis science research initiatives and educational programs and services, and Mt. Carmel Veterans Service Center where veterans, military, and their families can receive transition and wellness services. On top of this year-long donation effort, every Tuesday the brewery hosts a Bleating Heart Night, donating $1 from every pint sold that evening to a different non-profit each week. There is never a shortage of happenings at the brewery – they have events almost every night of the week. Need to get your sweat on before quaffing your beer? They have weekly yoga and Brewery Bootcamp events. Or perhaps you and your friends need a little friendly competition – weekly trivia may be your thing. By Thursdays, most of us can get pretty stressed from the work week, so why not unwind with a beer and adult coloring contest? Goat Patch also has a varied and reliable rotation of local food trucks, as well as offering their patrons the ability to get food from the other Lincoln Center food vendors, such as Cafe Red Point which features organic, local, free-range nutritional dishes, Nightingale Bread for your bread, pastry and pizza cravings, and newly opened Nordic restaurant: Smorbrod.